**Time for this post? Reading…8 minutes. Viewing…5 minutes. Implementation…undoubtedly the hardest part. I’m thinking of the holiday advantage of having family members all together at some time during the season. And do what with that opportunity? Use it as a chance to talk about your wishes for body disposition when you are no longer using it. Or—if you are an adult child of living parents—it’s a chance for you to find out what they want. But won’t they figure out what to do? Sure, they’ll do something with your body after you’ve died. They have to because of the urgency of the situation. But they may go through a lot of agony wondering if they’re getting it right. Or they may do something totally contrary that leaves you shouting, “No, no, no!” from out in the ether. They may end up disagreeing with each other, each one certain he or she knows what should be done. Case in point, my grandfather who, it turned out, was deeply offended by the idea of cremation. Not just for himself but for everyone. My mom, his daughter, died before he did. I was the executor and in charge of making the arrangements. When he found out she was to be cremated, he was distraught, calling me multiple times to coerce me into burying her instead. The exchanges went like this. Mom died at age 57. Young. Before her time. But she didn’t die without warning. She had breast cancer in 1980, when treatment was less successful than it is now, and she died in under two years. But she did have those two years to make sure we all knew what she wanted. She told us, her kids, that she wished to be cremated… but I imagine she avoided that conversation with Grandpa because by then she didn’t have the strength to hold her ground with him. Four days before Mom’s death, I was in the hospital taking notes about her wishes. The week after she died, I scrambled to pull myself together and make arrangements (without the benefit of email and internet) for a memorial in her school auditorium in a town 200 miles from where I lived. I got through it, as one does. I was 35. It was tough. Fending off my hurt and angry grandfather made if a lot harder. …death a part of your life. That means committing to staring down your death fears—whether it be your own death, the death of those you love, the pain of dying, the afterlife (or lack thereof), grief, corpses, bodily decomposition, or all of the above. Accepting that death itself is natural, but that death anxiety and terror of modern culture are not. Here’s her take on dealing with death denial. So many ways to decay! I was just reading that in some places it’s possible to be buried without a casket and then a tree is planted over the grave. Has anyone else heard of that? The other day I was reading that embalming is really toxic to the workers doing it and it’s not even legally required. 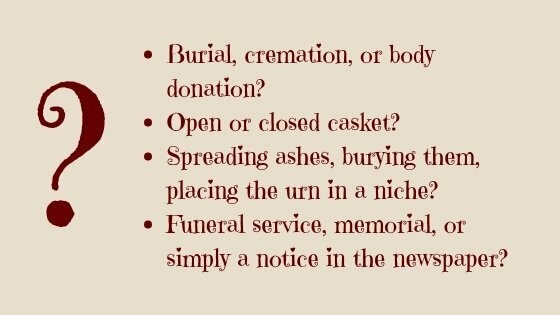 It got me thinking that I want to be buried without embalming. Anyone else know about this? I just read that there are caskets made of bamboo and seagrass because they are more eco-friendly. Who knew?! I was watching a TEDx Talk last week. The speaker said that crematoriums are a source of mercury pollution. Any guesses why? I was just reading that it’s possible to be cremated in a cardboard container, and it’s a good idea because it is eco-friendly. Am I the only one who didn’t know this is an option? I was just watching a video about an alternative to cremation. Anyone ever heard of freeze-drying a body? I was watching a Marketplace investigation about up-selling in funeral homes. Did you know that funeral directors are on commission? The investigation found them pressuring people to buy more expensive caskets than they wanted, and to have the body embalmed when it totally wasn’t necessary. These are some ideas. I’d love to hear your conversation starters. This entry was posted in Conscious Dying, Conversations about dying and tagged death, dying, talking about death, funeral preferences, death denial by Laurana Rayne. Bookmark the permalink. Last Friday I went to a most amazing funeral that was so profound, I feel it was a life changing experience. We were asked to gather at a beach close to the home of the deceased. After quite some time, 12 strong men came down a pathway carrying the coffin from the house to meet 200 or so of us gathered, a hush fell over the crowd. Friends, from little ones to older people, respectfully followed the coffin along the beach, the wind and rain falling upon us like a joke from our friend who had died. His motto was ‘choose life’! The destination was a huge pine tree, under which were fire drums, speaker equipment, chairs, etc. The service began with smudging of the coffin by an indigenous mate who chanted an ancient Aboriginal chant. The casket had been made by friends over the prior 4 days from a fallen Macrocarpa tree, sourced from the Hobart Botanical Gardens. Richard’s 11-yr-old daughter recited a very beautiful prose about acceptance and giving. Rich’s Father spoke…the most important thing Rich wanted to do in life was to be the BEST FATHER he could be! When his Mother spoke, she was heart broken…as mothers, our hearts went out to her as she recounted his life achievements chronologically. We were huddled together, sheltering from the wind and rain that had continued unabated. In some strange way, that too, played a part in bringing us all even closer, as we supported one another with a real feeling of ‘community’. So much courage from all his immediate family! Following the formalities, hot chai, food, drink, live music were available for us all to partake. During this time, there was opportunity to write messages on strips of cloth, or ‘surfboard’ cutouts, and hang our offerings on a rail around the coffin, for the family to take home later to read and digest. At sunset, the final part of the proceedings took place where en masse, we all walked out across the sand flats, thru low tide water, once again, following the 12 strong men carrying Rich’s coffin to a waiting dinghy. He was gently placed in the craft, the 11-yr-old daughter shot a lit arrow into the air, ‘shooting’ her Dad ‘to the stars’! We were silouetted against the backdrop of ocean and distant hills, 200 people, watching the dinghy being rowed out of sight, taking our beloved friend to the next part of his journey. In 2 weeks time, the older daughter will lead a paddle from a local beach where her Dad’s ashes will be scattered. Almost a week has passed since this incredible event, the community is still feeling the effects, and probably will for some time to come. I and other friends are comforting each other as we recount that day, what it has meant to us individually, and as a community. We have a very special community here in Dodges Ferry, Richard’s funeral has added another deep and profound connection.